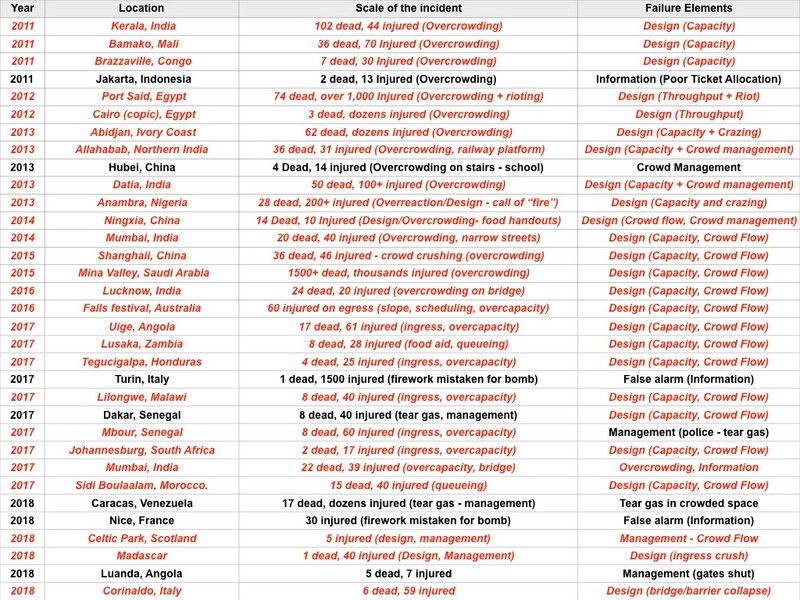 Over the last 25 years there have been a number of significant crowd related disasters. Below is a short list (but not all). We reviewed the underlying causality in these disasters to understand how the DIM-ICE model can be adapted to improve understanding of causality in accident/incidents and how we can develop better teaching programme to try and prevent future accidents that have similar underlying causes. As we can see from the above there is a high percentage of design related disasters (in�layman's terms - this is simply too many people and not enough space). Calculating safe passage through entry systems, into and out of events and from area to area in the complex and built environment is not difficult and I'm working on a series of teaching modules for risk assessment and risk management for crowd safety. Even with queueing systems in place, whenever crowds can arrive in numbers than may exceed a systems capacity there is a risk of problems. Identifying�the nature, duration and scale of that risk is relatively simple maths. �Click here for a�page on queueing theory.